I decided to tweak the recipe to use a little less sugar, add in a splash of vanilla extract, and about 1 tsp of ground cinnamon. From there, my husband and I made it our own. Being Florida natives, we got to talking and decided that Key Lime pancakes were the perfect tribute to a hot summer Saturday. They turned out great, so we wanted to share the recipe here! Try them soon before the weather turns cool- it will feel like one last vacation before fall starts up full-force. A delicious, zesty pancake that will make you feel like you are in the Florida Keys! Make your pancakes according to the directions of your recipe. 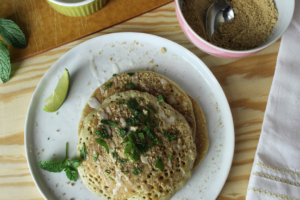 To make the glaze, mix ½ cup confectioners sugar with the juice of ½-1 lime until it is a semi-thick consistency, able to drizzle over pancakes. Meanwhile, pulse the Graham crackers in the food processor until they are fine crumbs, or crush in a zip-top bag until finely crushed. 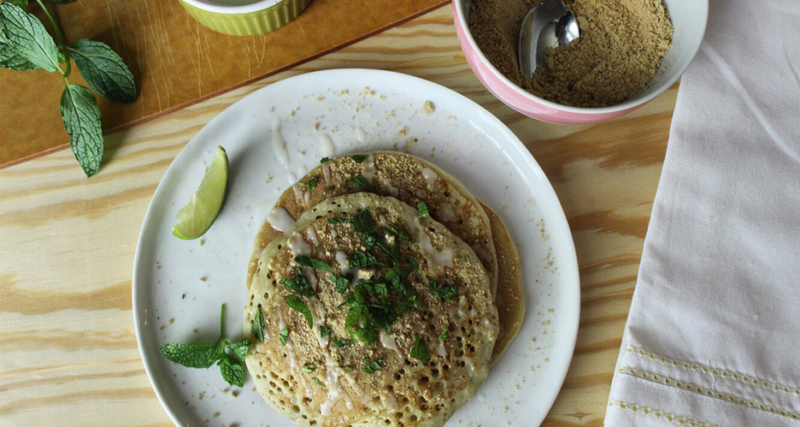 Top your pancakes with a drizzle of the glaze, Graham cracker crumbs, and bits of chopped fresh mint.